This Project Lead the Way course provides an overview of the fields of Civil Engineering and Architecture, while emphasizing the interrelationship of both fields. 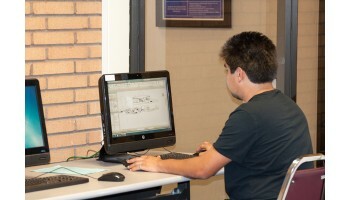 Students use state-of the-art software to solve real-world problems, and to develop solutions to hands-on projects and activities. The major focus of the course is a long-term project that involves the development of a local property site. As students learn about various aspects of civil engineering and architecture, they will apply what they learn to the design and development of this property. The student and teacher have the flexibility to develop the property as a simulation, or as a real-world task that civil engineers and architects experience when developing property. The course covers the following: the roles of civil engineers and architects; project planning; site planning; building design; and project documentation and presentation. Students will use Revit, a state-of the-art 3-D design software package, to help design solutions for major course projects. Working in teams, students will learn about documenting projects, solving problems, and communicating solutions to other students and to members of the professional community of civil engineering and architecture. Frankie S. has successfully found employment as a Dental Assistant after completing course(s) in Registered Dental Assisting.